In less than a month, FIRE has written two letters to Regis University contesting its decision to shut down a student’s “Social Justice Bake Sale” event, a dean’s refusal to admit the university censored the bake sale, Regis’ president’s shift to boasting that the university quickly censored the bake sale, and Regis’ repeated statements that the student’s bake sale violated federal law. The controversy over the bake sale at the Denver, Colorado university first began March 16, when student Alexander Beck set up a “Social Justice Bake Sale” as a response to the university’s “Social Justice Week” programming. Beck had received permission for the event from the university’s event coordinator the day before. 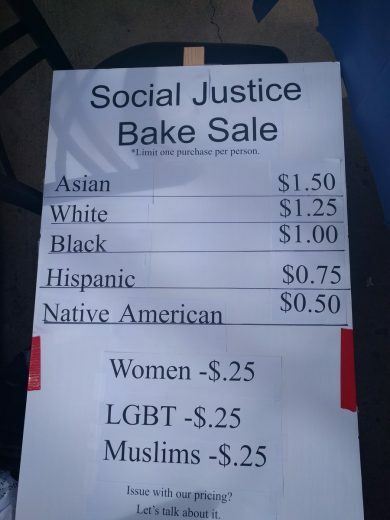 The bake sale offered different prices for baked goods depending on students’ gender, race, sexuality, or religion and invited students to discuss the prices if they disagreed with them. Bake sales like Beck’s are not uncommon protests, and have led to controversy and censorship at campuses across the country. Beck’s bake sale proved no different. About an hour after he set up, Dean of Students Diane McSheehy approached Beck, asked to speak with him, and rejected his request to record the conversation. According to Beck, McSheehy claimed that because Beck stated that his event was being held in protest of Regis’ Social Justice Week, the table constituted a “demonstration,” and that Beck had not followed the school’s demonstration guidelines. Beck was not allowed to continue with his event. Thanks for your email. Your table was not “shut down”. I thought in our conversation I was very clear about that. I simply wanted to connect with you about the correct process and procedures that need to be followed in order to have a recognized organization and to table as such. When I first came down to talk with you, you were the one that stated you were “protesting” that is why we also had the conversation about the correct procedures for having a demonstration. I thought we had a good conversation and I am happy to answer any questions or concerns that you may still have. I also have you and Nick on my calendar for next Tuesday for a follow-up conversation as we agreed to today. Looking forward to continuing our conversation on Tuesday. Under this practice, any speech that is disfavored by administrators could be censored on the basis that it could be seen as a “demonstration” against something. While Beck’s expression was certainly intended to be a “protest” of events going on at Regis University, that does not mean it can be unduly burdened by further restrictions intended to apply to protests in the form of marches or rallies that may incur additional logistical considerations. Many students feel compelled to make their voices heard specifically because they encounter speech they believe deserves a response, or a “protest.” Indeed, even students who wish to host a tabling event in support of Regis’ Social Justice Week are arguably “protesting” injustice. Surely Regis would not claim that those students could not continue their event as well, even if they only gained approval from Regis’ Event Services? Regis failed to respond to the concerns raised in our letter. Instead, the administration made public statements admitting that the university shut down Beck’s event, and even went so far as to argue that the bake sale violated federal law. “Regis University welcomes and encourages diverse viewpoints on campus. However, the bake sale you referenced violated university policy and federal law by selling items at different prices based on race and gender,” Regis claimed in a March 31 statement to the media. That’s an interesting claim from Regis’ president since the university’s dean of students claimed Beck’s event was “not ‘shut down’” in her March 16 email to him. Categorizing the bake sale as a violation of federal law ignores or willfully misinterprets the expressive purpose of the event. Beck did not seek to create a profitable commercial enterprise—indeed, he pledged not to keep any meager profit—but to make a statement. Protests that rely on satire—such as Beck’s “Social Justice” bake sale and feminist “wage gap” bake sales, both of which utilize proposed transactions to highlight perceived flaws in society or policy—exist to challenge, provoke, and, indeed, often offend. Satirical political protest is at the very heart of our country’s honored traditions. In Hustler Magazine v. Falwell, 485 U.S. 46 (1988), the Supreme Court of the United States ruled that the First Amendment protects even the most blatantly ridiculing, outlandishly offensive parody. Lastly, we noted that Regis — which held campus events offering students an opportunity to voice their thoughts about the bake sale, including “an open forum for students who felt marginalized, attacked or unsafe” because of the event and the “Courageous Conversations” discussion — clearly understands the power of counter-speech, and has no reason to resort to censorship. [T]hat some—or even many—members of the campus community were offended by Beck’s event is not cause to censor it. The proper response to speech that offends others is “more speech, not enforced silence.” Whitney v. California, 274 U.S. 357, 377 (1927) (Brandeis, J., dissenting). That Regis held discussions in response to community members’ opposition to the event is evidence that the university is aware of the power of rigorously debating and refuting ideas with which one disagrees. Regis clearly recognizes the value in encouraging students to use their own voices to respond to the bake sale, but it cannot expect students to substantively engage each others’ views, or to change each others’ minds, if the expression of some views is to be met with censorship and punishment. We hope Regis finally responds to the concerns we’ve raised in our letters — and with better arguments than the ones its leadership has put forth thus far. Until the university changes course, no student speech will be safe at Regis.